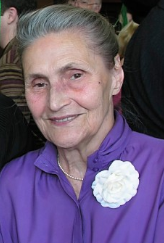 Anna’s Babcia (grandmother in Polish) passed away Saturday. Anna’s dad went to check out her and she was unresponsive sitting at the kitchen table. He called an ambulance and the EMTs came and went through their resuscitation procedures to no avail. We had plans to travel to Ohio for her 95 birthday this coming Saturday but we will now be attending her funeral. She was a strong woman who lived a long live. Anna's parents brought her to the US from Poland a few years ago after her husband passed away.